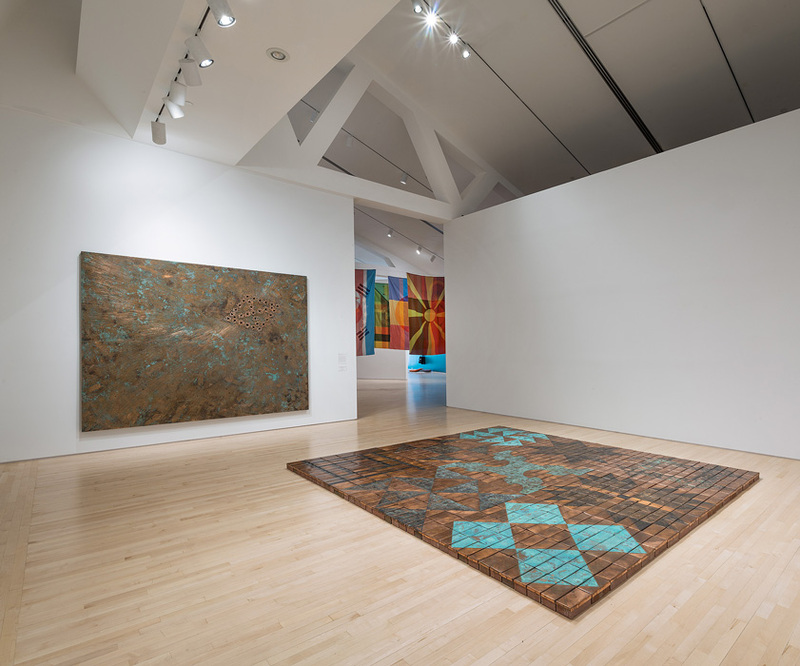 Nari Ward (Jamaican-American, born 1963), "Breathing Panel: Oriented Right," 2015, oak wood, copper sheet, copper nails, darkening patina, 96 x 120 x 1¼ inches. Collection of Allison and Larry Berg, Los Angeles. Courtesy the artist, Lehmann Maupin, New York and Hong Kong. 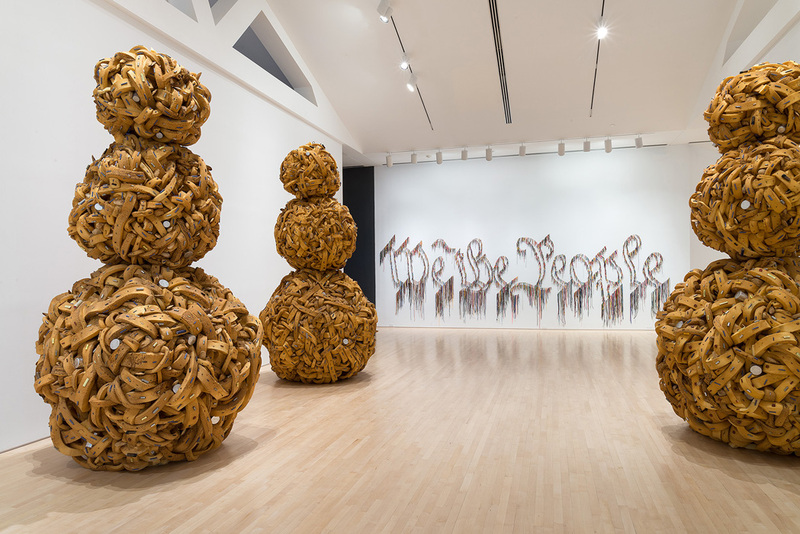 Installation view: Nari Ward, "Mango Tourist" (2011, courtesy of Lehman Maupin, New York and Hong Kong) and "We the People" (2011, courtesy the artist, Lehmann Maupin, New York and Hong Kong). 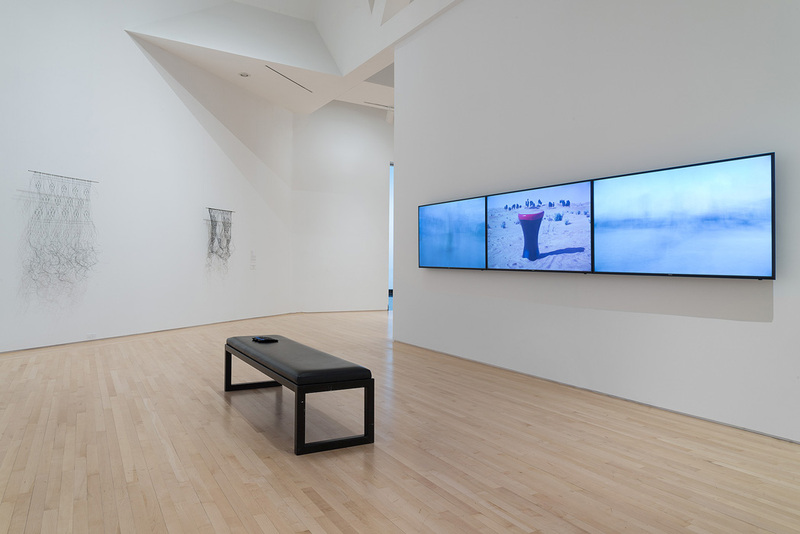 Installation view: Nevin Aladağ, "Session" (2013), "Makramé" (2011) and "Makramé" (2014). Courtesy of the artist and WENTRUP, Berlin © Nevin Aladağ. Installation view: Nari Ward, "Ground (In Progress)" (2015) and "Breathing Panel: Oriented Right" (2015). Collection of Allison and Larry Berg, Los Angeles, courtesy the artist, Lehmann Maupin, New York and Hong Kong. In the grand scheme of art history, abstract art is still a new genre, but it is also old enough for reappraisals. In “Worlds Otherwise Hidden,” curated by Erin Dziedzic, the Kemper Museum’s director of curatorial affairs, three international artists are doing just that. No longer is abstraction about academic formalism, spiritual excess or pseudo-scientific purity. Instead, Nari Ward, Kimsooja and Nevin Aladağ make abstract art from a cultural, historical and cosmopolitan perspective. Nari Ward, a Jamaican artist working in New York City, has numerous pieces in the exhibition, but the most impressive are two (seemingly) minimalist copper sculptures. 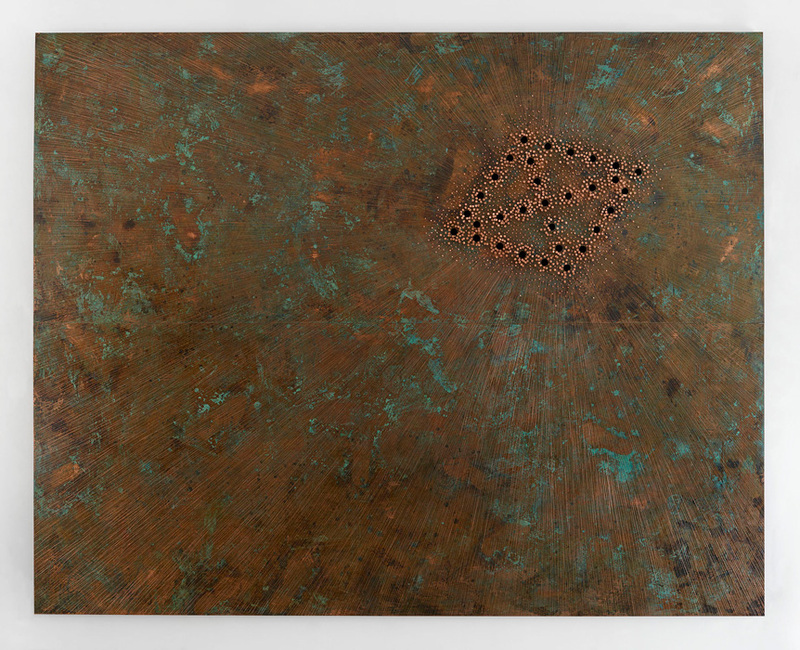 “Breathing Panel” is a large copper sheet hanging on the wall, with holes punched in a diamond pattern. Scratches radiate out from the holes on the oxidized metal surface. The diamond pattern is a Congolese Cosmogram, a symbol that depicts the universe within that tradition, but Ward first saw the pattern at the First African Baptist Church in Savannah, Georgia, where the holes were cut into the floorboards so that escaped slaves hiding beneath the church wouldn’t suffocate. Similarly, “Ground (In Progress)” is a floor piece of copper sheets over bricks. Oxidized into the surface are symbolic codes that were used by the Underground Railroad to direct escaped slaves to safety. The floor piece is obviously reminiscent of ‘60s minimalist Carl Andre’s various installations of metal floor tiles. But unlike the works of the minimalist, who avowed objective neutrality, Ward’s copper works offer a critique of the history of slavery. While we Americans often celebrate the abolition of slavery as a moral awakening, it can’t be ignored that abolition coincided with industrialization. When you can replace human labor with machine labor, taking the moral high ground becomes easier. While some of the early 20th-century Dadaist and Futurists made connections between man’s freedom and mechanization, it wasn’t until the ‘80s, when Peter Halley offered his critiques of minimalism as a perverse celebration of industrialized oppression, that artists and theorists began reexamining the movement’s history. Ward directly questions Halley’s assertions, making clear the relationship between the end of slavery and the Industrial Revolution. In the back of the exhibition is Kimsooja’s “To Breath – Zone of Nowhere.” In a dimly lit space, dozens of flags hang from the ceiling in rows, billowing slightly. Each flag is actually multiple flags, rendered partially transparent and overlapping each other. On one, you can make out the individual flags of North Korea, South Korea, the European Union and Antarctica. On others you can make out snakes, stars, shields, stripes and many other symbols. Kimsooja was initially commissioned to create a video of flags for the recent Summer Olympics in South Korea and afterwards took the images and printed them merging into each other. ourselves as a young country, at 250 years old we are actually one of the oldest continuous governments on the planet. Given the wars, revolutions and coups of the 19th and 20th centuries, we are a bit of a statistical outlier and it begs the question: ‘How much longer?’ Nations fade. No one talks much of Saxons, Visigoths or Sumerians anymore. 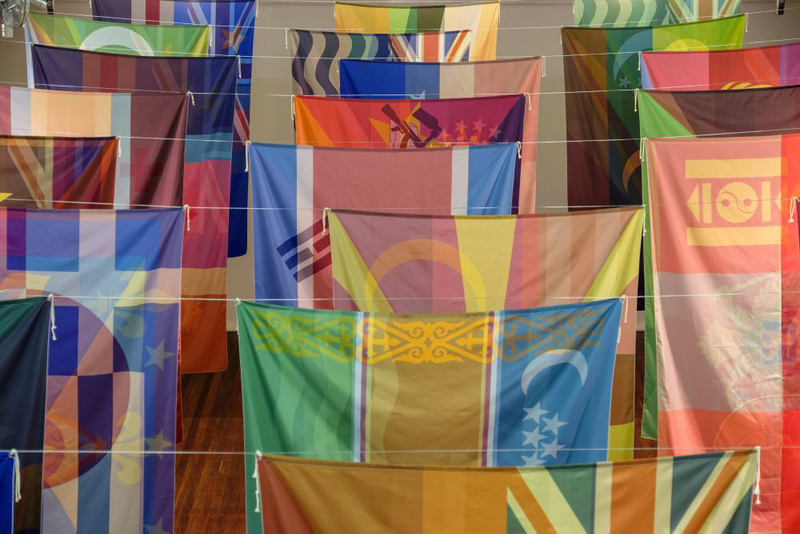 And while those who celebrate multiculturalism will likely enjoy Kimsooja’s new abstracted flags, diehard nationalists will likely see the installation as an omen or maybe even a threat. Nevin Aladağ, a Turkish artist living in Berlin, has multiple sculptures and videos in the exhibition. 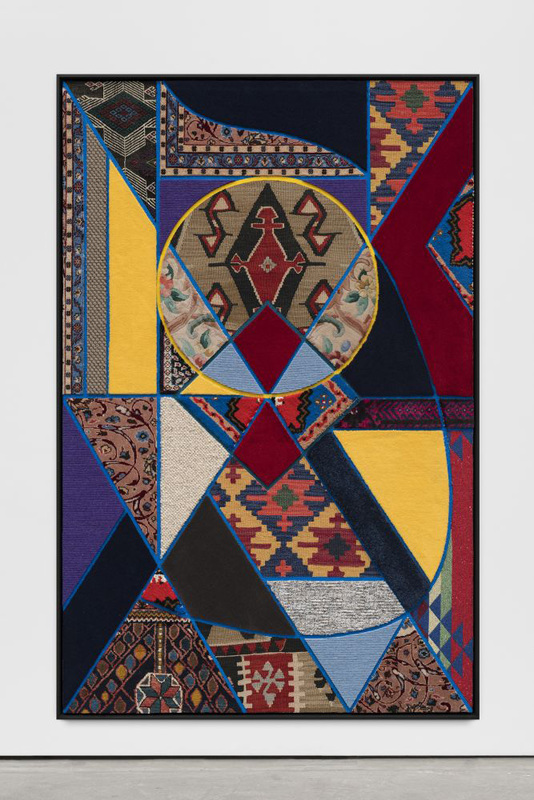 “Social Fabric,” a series of textile wall sculptures, is made from a variety of carpets. The works visually resemble mosaics with grout more than they do quilts. The juxtapositions of patterns, from detailed oriental rugs to durable monochrome beige carpet, creates a mixed space of high luxury and industrial utilitarianism. One of Aladağ’s videos, titled “Session 2013” has three channels showing various percussion instruments rolling around dusty streets, tied to bicycles or being spattered by water sprinklers. Aladağ’s idea is to take local instruments, in this case from various Middle Eastern and African cultural traditions found in the United Arab Emirates, and allow the local environment to ‘play them.’ Commissioned for the Sharjah Biennial, the work speaks to both the cosmopolitan nature of the UAE, but also very much the government’s current diplomatic strategy. By using government funds to commission international artists, buy out auctions and construct grand museums, Abu Dhabi and Dubai have become the center of the art world in the Middle East. In many ways, Dubai is set to become the cosmopolitan center for 21st century art, much like Paris was for the 19th and New York for the 20th. When European artists struck upon abstract art in the 20th century, there were many lofty claims. Some preached that the paintings without images could speak to a universal soul or that geometric forms, being mathematical, would be universally understood. These claims were exaggerations. To those outside the great cosmopolitan centers of the world, the artworks were incomprehensible. Yet, over the last century, some of those promises seem to be coming true. If abstract art is universal, it isn’t because of an inherent mathematical or spiritual purity, but because of a hundred years of cosmopolitan exchange. Abstract art allows artists to bring their specific cultures into their artwork, whether it is the symbols of the Underground Railroad, geometric national flags or older abstract traditions like textile weaving. Diehard nationalists, isolationists and conservatives have long rallied against abstract art as decadent and anti-tradition. But if abstract art is not universal, then it is surely becoming so. Neil Thrun is a writer and artist living in Kansas City, Missouri. He is a 2010 graduate of the Kansas City Art Institute and was a resident artist with the Charlotte Street Urban Culture Project in 2011 and 2012. He has written for publications including the Kansas City Star, Huffington Post and other local arts journals.